Tread lightly. Leave your mark. A part of the College of Leadership & Public Service, the Institute for Sustainable Practice was a response to the new pollution, rising gas prices, and extreme weather in 2007. Since then, we’ve invited pioneering entrepreneurs, innovative scientists, creative engineers, visionary policy makers, and other sustainability leaders to share their proven insights, best practices, and research. Through their tutelage and our students’ passion in their diverse disciplines, Lipscomb faculty, students and alumni now add regenerative energy to their communities and the world. 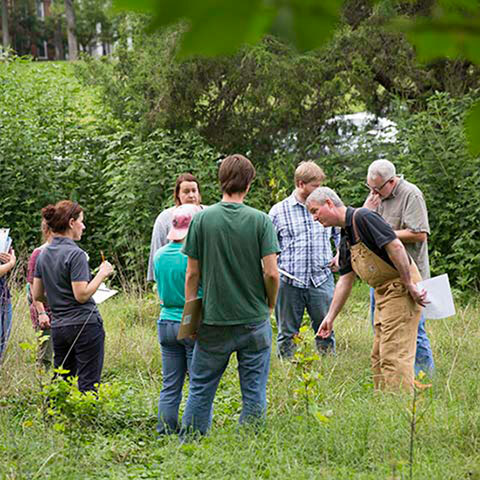 The Institute for Sustainable Practice offers an innovative curriculum at the intersections between business and the natural and social sciences. You will benefit from close relationships with our top-tier practitioner faculty and gain practical experiences with cutting edge best practices through dynamic classes and field studies. ISP's convenient schedules combining live lectures and online content are perfect for busy professionals, and you can even earn graduate credit for a variety of green professional accreditations, enhancing your career before you even graduate. Grow in a holistic approach to stewarding creation and people. We'll teach you modern sustainability's core principles. Learn expert methods to foster and bolster people, society and economic prosperity with social purpose. Learn the science of sustainability and help both businesses and people transform careless behaviors into mindful habits. You’ll be equipped with a holistic approach that helps focus on the triple bottom line: people, profit and planet. Add regenerative energy to your community and the world.